Photograph courtesy Roger Geach 25292 passes through Inverkeithing on June 24th 1981 with a Leith - Aberdeen pipe train. The fifteen year career of D7642/25292 started with two years at Sheffield area depots followed by thirteen years on the LMR. Boiler room grilles sheeted over (1976). Time between last Classified repair and withdrawal: 64 months (assumes 6/76 as Classified date). March 1967 to London Division (Western Lines) (D01). April 1967 to Nottingham Division (D16). September 1967 to Springs Branch (8F). September 1967 to Liverpool Division (D08). May 1970 to Birmingham Division (D02). May 1974 to Springs Branch. 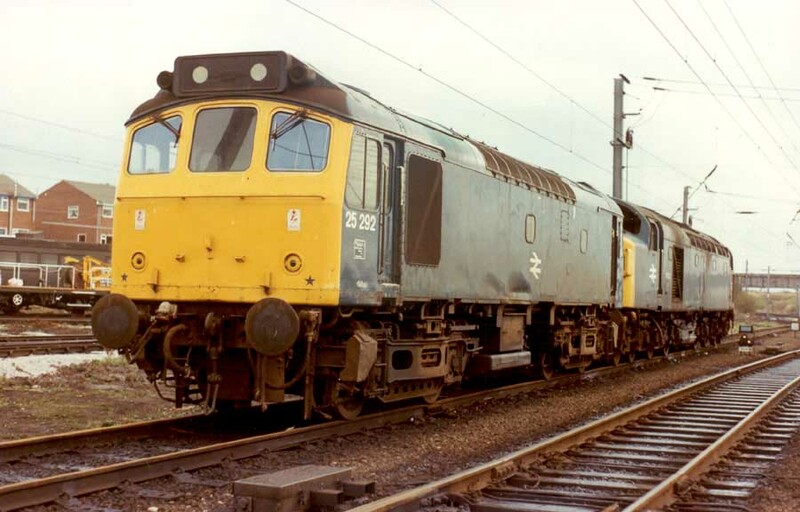 25292 was the 117th Class 25 withdrawn, one of six retired during October 1981, including sister locomotives 25290 & 25299. After withdrawal 25292 was stored at Springs Branch until moved with 40095, 40134/178 to Swindon on December 14th 1981 and scrapped by the first week of March 1983. Photograph collection of webmaster 25292 at Springs Branch, date unknown, but most likely sometme in the last quarter of 1981 after it had been withdrawn. Noted Derby Works December 1970. Noted Derby Works May 1976 (Classified?). The recorded passenger workings of 7642/25292 although very few were quited varied. The first known working occurred on June 18th 1966 handling the summer dated 09.28 Sheffield - Llandudno Town & 14.28 return. 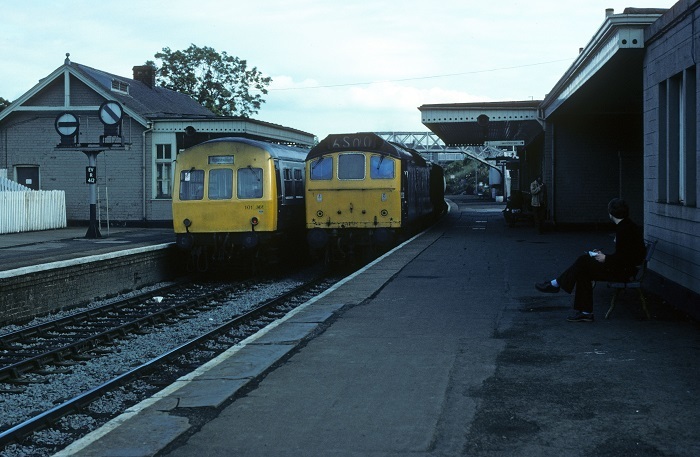 On Saturday July 24th sixteen empty stock workings were carried out at Oxley between the hours of 05.30am & 09.00am in support of the extra passenger workings typical of a summer Saturday, the carriage side pilots this day were 5229, 7517, 7640 & 7642. By June 1972 7642 had lost its body side numbers with the BR emblems on the cabsides for the more normal single bodyside emblem and cabside numbers. On January 18th the 18.00 Penzance - Bristol Temple Meads with Class 52 No.1007 utilised 25292 as pilot from Newton Abbot to Bristol. On July 12th 25292 & 25061 worked the 09.20 Manchester Piccadilly - Yarmouth as far as Lincoln, returning with the 09.15 ex-Yarmouth. Two East Midlands workings followed next: on May 30th it was a roundtrip Burton on Trent - Skegness with 25292 & 25242, the next day (31st) the same pair worked a Beeston - Southport mystery excursion throughout. 25292 and 25272 departed from Bewdley with the 'Severn Valley Limited' for Paddington on a frosty November 13th, with the train comprised of a full rake of restored GWR Collett coaching stock. On August 7th the 09.35 Euston - Aberystwyth day excursion was worked out and back from Birmingham New Street by 25292 & 24087. The 17.10 Cardiff - Crewe was worked by 25292 on May 22nd. On July 29th 25292 was stabled at York. Further workings over the Crewe - Cardiff route took place on August 6th & 7th with at least one round trip each day whilst on August 9th 25292 worked the 17.10 Manchester Victoria - Blackpool North. On August 12th 25292 was stabled at Chester. A train of empty carflats was noted southbound at Oxford behind 25292 on September 22nd, the locomotive later headed north light engine. On August 29th 25292 worked the 20.30 Crewe - Bangor. 25292 was noted northbound through Inverkeithing on June 24th 1981 with a Leith - Aberdeen pipe train. 25292 was noted passing through Edinburgh Waverley on June 27th with 25049. The last recorded passenger working was on June 30th with 25292 banking the 13.10 Glasgow Queen Street - Inverness to Cowlairs Junction. Possibly 25292 may have arrived on a service from Dundee, in order to be in position for the banking assist. 25292 was withdrawn on October 18th 1981, the 117th Class 25 to be retired. No.2 end headcode panel: displaying four digit display (no dominoes): November 1978 - June 1981. Non BIS side: substantial dent at frame level above battery box: November 1978 until withdrawn. Page added February 7th 2012. Last update November 2nd 2018.